10 Best Places to Visit in Saudi Arabia - Saudi Arabia is known as a holy place because it started from where Islamic civilization developed. Saudi Arabia is also known as the land of the prophets, for it is in this land that the prophets are born. All these things are also not separated from the beauty and splendor of the oil country, many historical developments that originated from this city. Well, this time will be described some interesting sights that exist in the land of the prophets of Saudi Arabia. 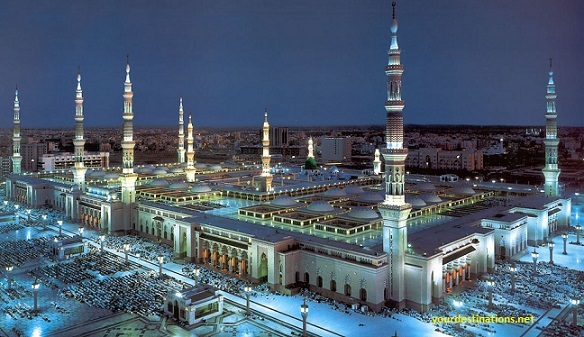 The first interesting tour that can be visited while in Saudi Arabia is Al-Masjid an-Nabawi located in Medina. Al-Masjid An-Nabawi is one of the most important symbols of Islamic Religion especially in Saudi Arabia and is the 2nd sacred place in the world. Al-Masjid an-Nabawi in Saudi Arabia was built by the Prophet himself, and grew up to his present stature, by later Islamic rulers. If a visit to Saudi Arabia will definitely visit this place especially who is or will perform the pilgrimage and Umrah. Furthermore, there is Al-Ula which is one of the most interesting sights to visit Suadi Arabia. Al-Ula in Saudi Arabia lies somewhere between Al Madinah and Tabuk in the central region of Saudi Arabia. AL-Ula is an ancient site that once was a trading center in Saudi Arabia. This site is estimated to be more than 2,000 years old. The next exciting tour in Saudi Arabia, the Jabal Magnet or often known as the Jin Valley, is a valley that is the location of the most interesting and unique wizard in Saudi Arabia. The famous phenomenon of this location is the existence of gravitational contradiction or the occurrence of an attractive force. Jabal Magnet is outside the Haram area so free to be visited by non-Muslims. This hilly area is believed to have thrust. Intrigued by this location try to visit this place and feel the sensation. Arafah Desert is one of the holy sites of Muslims in Saudi Arabia. This place is described as a replica of the Masyar field when humans are raised from the grave later. Padang Arafah is also a very important place for people who are performing Hajj because Arafah is the place to do one of the pilgrims that are Wukuf. This one tourist place is one of the tourist attractions that are visited by many tourists during their stay in Saudi Arabia, in this place tourists can meet and get acquainted with the native Arab tribe of Baduy tribe who still like to move. Najd is also a plateau with a height of 762 to 1,525 meters located in Riyadh. Jannat al-Baqi is a very historic burial ground for Muslims especially in Saudi Arabia because it contains the remains of many relatives and friends of the prophet Muhammad including his mother-in-law and grandfather buried there. At least there are about 7 thousand companions of Prophet Muhammad SAW buried here. The Jawatha Mosque located in Al Khilabiyah built in the 7th century is one of the most famous mosques in Saudi Arabia. The mosque was built by a tribe known as Bani Abdul Qais who occupied the area in the early period of Islam. Tourists must travel around 12 kilometers east of Hofuf before finally reaching this place. This mosque is highly recommended for tourists who want to conduct Islamic tours. Well, this is the main tour that tourists should visit while in the land of the prophets. In addition to being a location for performing Hajj and Umrah, the Grand Mosque is also a particular attraction for world travelers. The mosque is located in the city of Mecca known as the holiest place for Muslims. This mosque was built around the Kaaba which is the direction of the Qiblah for Muslims around the world in working worship. This mosque is also known as the largest mosque in the world. Millions of Muslims come to this mosque to worship every year. According to a hadith, if a Muslim performs a prayer in this mosque, then the reward is equivalent to doing 100,000 prayers in another mosque is extraordinary. In addition to Madain Saleh, which is rich in historical value, Mount Uhud in Saudi Arabia is one of the other historic sites and is where Uhud fighting battles occur. Mount Uhud stretches from east to west and has a slope toward the north and covers a total of seven kilometers in length and three kilometers of breath. This place is famous for its beauty and exotic structure. Well, that's the list of attractions in Saudi Arabia that must be visited the version of Yourdestinations.net. Which tourist attractions will you visit? Share Please!